I created this card for the Lawn Fawnatics Challenge #5, which was made based on a spring inspiration board (I was inspired by the colors and nature aspect). 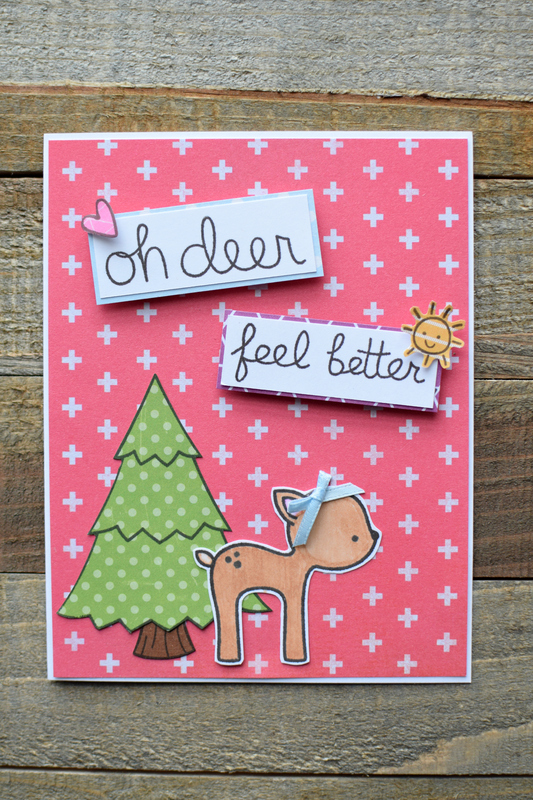 I used three different Lawn Fawn stamp sets for it, the pine tree from “Critters in the Forest”, the deer, heart, and oh deer sentiment from “Into the Woods”, and the feel better sentiment and sunshine from “So Much to Say”. Papers were all from my scrap box, so I’m not sure what brands they are, but I adore how the colors look together! This entry was posted in Cards/Scrapbooking on May 31, 2017 by Megan. 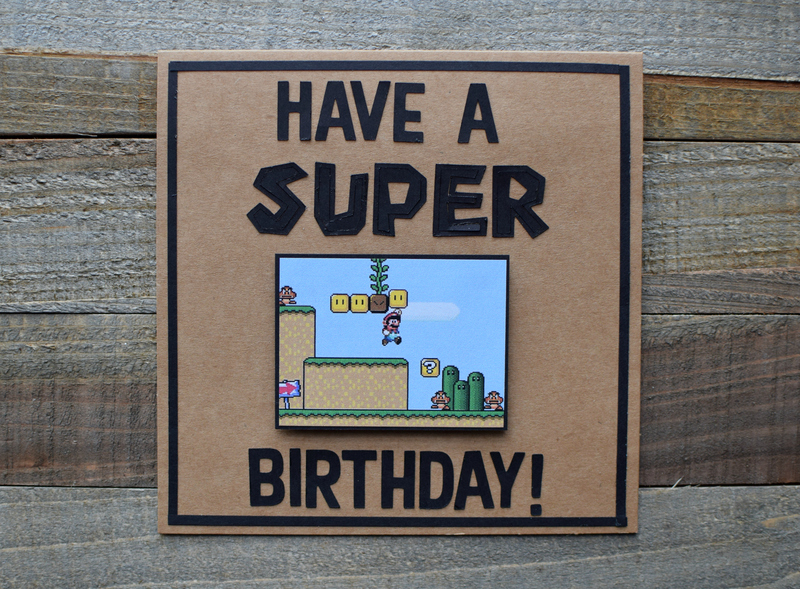 While trying to come up with a birthday card for my husband’s birthday, I stumbled across a website that had Mario fonts! It was pretty exciting, since I could download one and use it with my Silhouette Cameo. I chose the Super Mario Bros font, downloaded it, and then used it for the word, SUPER in this card. For the picture, I found an image online from Super Mario World that I printed out, and added to the card. Voila! An easy, but fun card for my husband’s birthday, which is today! This entry was posted in Cards/Scrapbooking, Silhouette Projects on May 30, 2017 by Megan. I’ve been working on a few crafts here and there, including some cards! One of my favorite stamp companies, Paper Smooches, holds a challenge each month, and I finally decided to create something for this month’s, which theme is Flowers. I don’t have nearly enough stamp sets from the company, so I had to get creative with my use of flowers and of their stamp sets. I went through my scraps and found some papers I liked together, and even better is that they coordinated perfectly with the flower stickers I wanted to use. The sentiment is from Paper Smooches, “Pretty Phrases“. This entry was posted in Cards/Scrapbooking on May 25, 2017 by Megan. This is the third of four Mother’s Day cards I made using the set, “Mom + Me”. One thing I did different for this card, is actually cut the card a lot narrower than I usually would have, to allow for the sentiment paper to hang off of the sides, but yet still fit into an envelope to mail. I really like how it looks, and will have to try the technique on other cards in the future! Anyway, I’ve always loved using kraft colored papers in my cards, so when I saw this kraft paper with white hearts I knew it had to be used in this card! Gray, yellow, and a light blue seemed to be the perfect complimentary colors to go along with it, and I love how they look together. 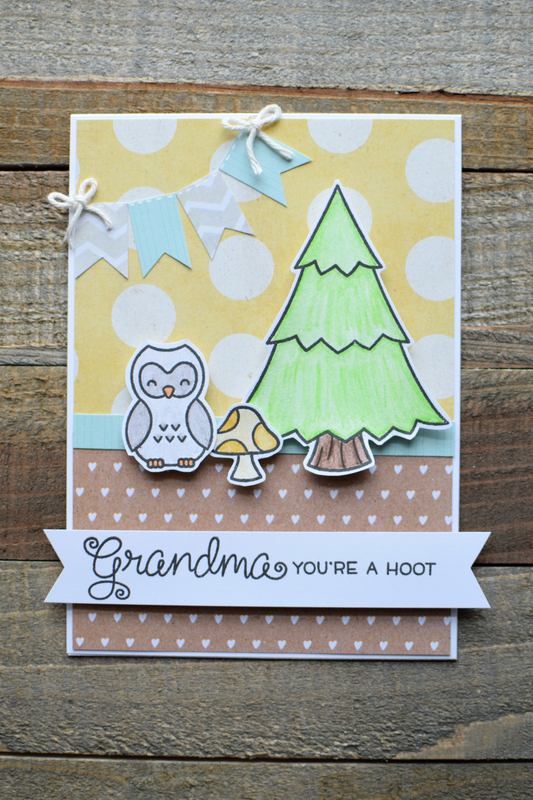 The pine tree and mushroom are from Lawn Fawn’s “Critters in the Forest”. And that darling kraft heart paper? 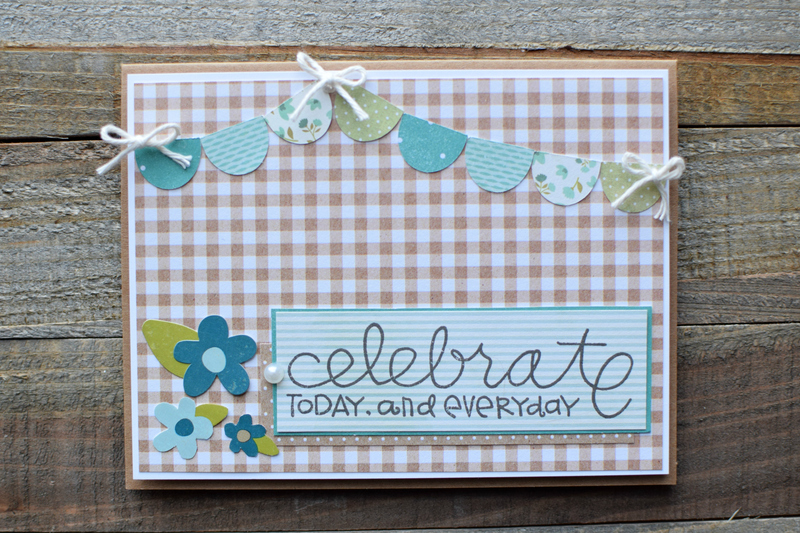 It’s from the Pebbles, “Spring Fling” paper pack! This entry was posted in Cards/Scrapbooking on May 11, 2017 by Megan.